They say not to judge a book by its cover but this one has an attractive and mysterious one that makes you want to look inside. It starts in a similarly dramatic way as a young hooded woman gets down from a carriage in a deserted street at dead of night. A shadow “looms” and “spreads over the walls” and a scream “tears through the dark”. When her body is discovered, horribly disfigured, it is a case for the inspector of strange and unexplained deaths, Volnay (in French, commissaire aux morts étranges) – a clever young man with long black hair and frilly white shirts. 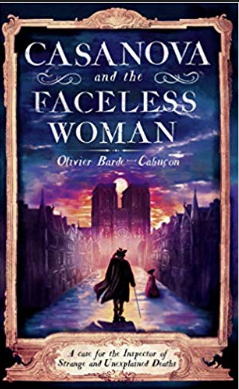 This is the first to be translated into English of a French mystery series set in the time of Louis XV. It is not subtle and some descriptions are clichéd – characters have hair that is ‘raven-black’ or ‘blacker than blackest night’, a girl has a laugh like ‘crystal’, Volnay’s blue eyes seem ‘veined with ice’. He also seems no Sherlock Holmes, with such modest deductions as that the dead woman has well-cared-for hands, suggesting social standing. Rather improbably it then turns out that the person who discovered the body was none other than Casanova, who was passing with one of his conquests at the time. A somewhat old-fashioned and melodramatic murder mystery; the setting in a less-well known period adds interest. A leisurely, reflective and descriptive read, this book by a British author and creative writing lecturer who moved with her husband to rural Aveyron – “this derelict part of France” – starts out gently appealing in its descriptions of rural life. However it tugs at the emotions more in later sections as the author describes her developing attachment to her pigs and the dilemma of killing them for food. Jacqueline Yallop starts her book with reminiscences about her urban upbringing and a fondness for escaping to the countryside which eventually saw her and her freelance journalist husband move to an isolated spot where they are the only residents in what was once a hamlet based around a busy farm. Her style has plenty of adjectives and images – the dog they acquire is an “indefatigable, scatty dalmatian of imperfect spots” and her house seems to “hide away… like a rabbit squatting in the undergrowth”. There is also plenty of local colour, such as descriptions of traditional breeds or asides about the origins of words. Yallop says the couple never originally planned to have pigs – the main subject of the book – but the idea grew gradually. 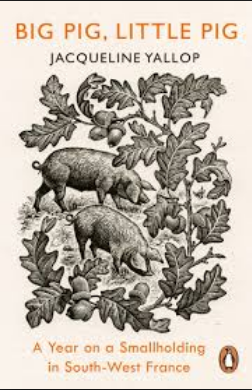 They finally bought two Gascon noirs, “an ancient hardy breed”, as “pigs need company”, with a plan to fatten them for a year before turning them into chops, hams and pâtés… but they did not realise how “endearing” they would turn out to be. Seemingly without tongue in cheek, Yallop states that her initial research revealed that pigs share much in common with people, “apparently, given the chance, they like to lie around, drinking, even smoking and watching TV”. An enjoyable study of rural life which raises serious points about the relations between humans and the animals we raise for food. Now only remembered by older inhabitants, there was for a few years after the Second World War a close relationship between the USA and the rural Berry area – and this book aims to keep alive the memories. It started with ‘Marshall Plan’ money; suddenly Berry farmers could invest in tractors – though one old timer left his on blocks in a barn for his son to inherit and carried on with horses. Then it was picked to host a huge US Air Force base which was a supply depot for others sprouting up around Europe as a bulwark against Com­munism – until de Gaulle shut US bases in 1967. 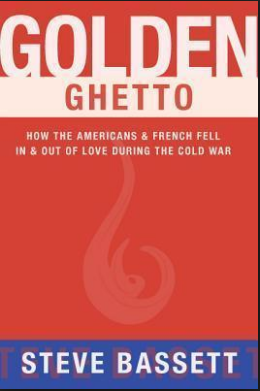 It was chosen partly because of support for Communism there and the arrival of several thousand American families caused plenty of friction at first, but eventually, Basset says, even most of them were won over as the ‘Golden Ghetto’ of the base – a mini-America – boosted the local economy. A distinguished American journalist, he heard tales of those days after buying a home in the area, and interviewed a host of Ameri­cans and French people about how the two sides got on. One old Com­munist described how G.I.s would toss kids gum in the streets, and how they were invited to the base to see movies and eat popcorn. It “created special bonds”, he said. 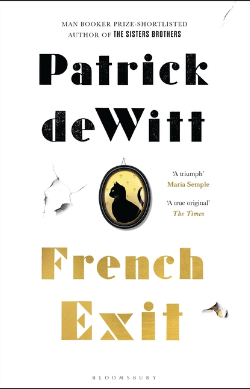 If you fancy something light and witty as relief from the current state of the world, French Exit could fit the bill. “Not quite P.G. Wodehouse, but close” said a Times reviewer about this book, and we would agree with that – there is something about its bantering tone and lightness of touch that is reminiscent of Wodehouse, especially as, like the world of Jeeves and Wooster, it is set in high society, but in modern times. The main characters are an inseparable mother and adult son, who live in a grand New York apartment over several floors where the daily routine includes things like coming home to eat a dinner the chef has left for them or eating lunch among leather-bound books in the library and where, naturally, one reclines on the sofa in the bathroom after taking a bath. However, the mother’s reckless spending of her late husband’s money means they have to downsize and move to a friend’s loaned apartment on Paris’s Ile Saint-Louis. They set about trying to find their place in the city in their own way, such as when the feisty, eccentric mother deals with a rude waiter who does not bring the bill promptly by spraying a flower arran­gement with perfume and setting fire to it. A fun novel about upper class characters and a friendly mother-son relationship which the author has said was inspired by his own.